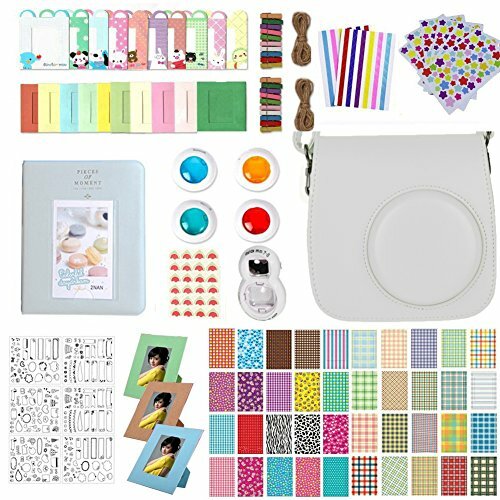 Accessories for Fujifilm Instax Mini 9, 12 in 1 Bundles Set for Mini 9, included Camera Case/Album Book/Close-up Lens/4 Color Filter/3-Inch Photo Frame/Colorful DIY Film Stickers (Smokey White) by MAEKIJOY at Tobby News. MPN: QI-MIN9-12W-US. Hurry! Limited time offer. Offer valid only while supplies last. 1*Mini 9 Camera Case with Strap The PU leather case and its internal soft layer can protect your camera and camera lens from stains and scratches.